Welcome to the fall blog hop hosted by the ladies of The Primary Punchbowl. We are excited you are here. 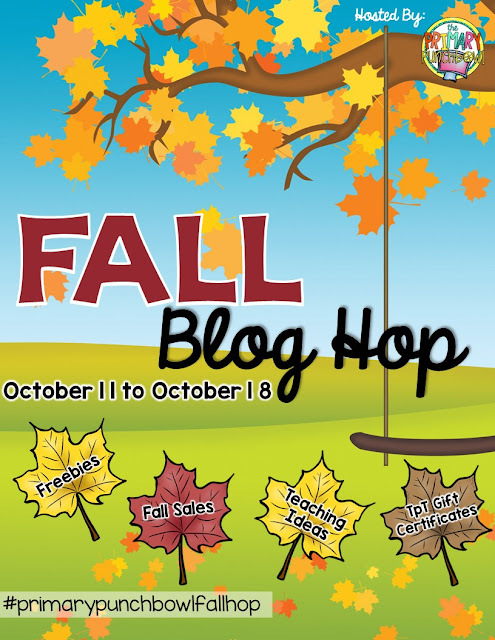 At each stop along the way, you will find freebies, fall activities for your classroom and fall items on sale. Each blog is giving away a gift certificate to Teachers Pay Teachers so you have LOTS of chances to win. Our new collaborative blog, The Primary Punchbowl, is also launching this week and there is another giveaway over there (think Kendra Scott jewelry and a teacher goody basket) so be sure to enter over there, too. One of my favorite activities to do in the fall with my students was an activity we called Make My Pumpkin. There are several different ways to do this. We would set out all different colored construction paper and just let the students (second graders) go to town making a pumpkin. No template, no restrictions, just let them create. Some just made a pumpkin, some make a jack-o-lantern, whatever they wanted. When they were done with the pumpkin, they had to write in extreme detail how they created their pumpkin. Since we had usually just finished a letter writing unit, my second graders would write a letter describing how to make it. The year I taught in a 1st/2nd multiage we had the first graders write how to's since that is what they were learning in writer's workshop. Then, they gave their writing to their partner/friend WITHOUT showing them their pumpkin. 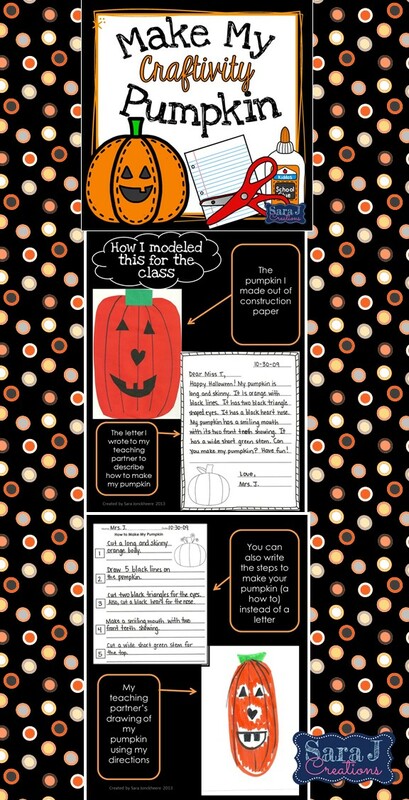 Using their writing (and hopefully they added a lot of details), they would try to re-create their partner's pumpkin. You could have them actually create the pumpkin with construction paper. Or you could have them just draw what they thought it would look like. When they were all done, they would compare their pumpkin to the one the partner made following the step by step directions. It was a good lesson in adding details and adjectives to help the partner really understand what they meant. It was also cute to hang them up side by side. For my freebie for you, I have Spin and Add Bump - Fall Edition. Last year, I started making Spin and Multiply Bump for the girls I tutor. Many of the bump games that I had downloaded for them used a dice so it only practiced numbers up to 6 unless I used a dice with larger numbers. I decided to just do a spinner because then they could practice the numbers 0-10. Spinners are so easy since all you need is a pencil and a paperclip. There are no dice bouncing off the desks. I decided to start an addition version that is along the same lines. You play it the same way but they add the number on the spinner to the number on the bottom corner of the page. This freebie has a different game board for numbers 1-10. I've included only the colored versions (the paid versions all come with black and white copies also) in this freebie. It includes fall clipart on each page. I just finished Halloween and Thanksgiving versions with plans to make one for all the seasons and holidays. Oh yeah, and if you don't know how to play bump, don't worry!!! There is a page of instructions as well as directions printed on the bottom of each game board. It is super easy and a fun way to practice math facts. Click the picture below to grab your freebie!! The four featured items in all of our TpT stores are HALF OFF for the next week. Search #primarypunchbowlfallhop to find all of our products. The four products I have on sale are all fall themed. 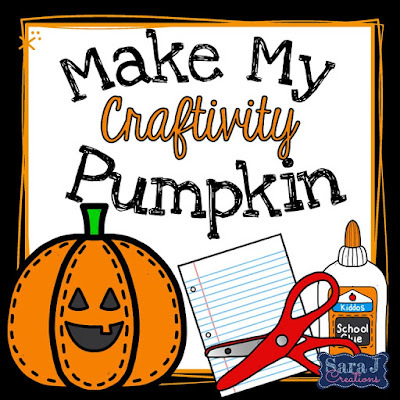 Make My Pumpkin, the craftivity I mentioned above, includes directions, different types of writing paper and even templates if you'd prefer your students to just draw instead of creating out of construction paper. 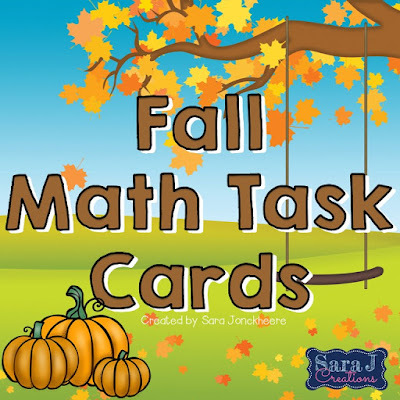 My fall math task cards are designed for second grade and feature 32 task cards (color and black and white version). They focus on place value, comparing three digit numbers, word form, expanded form, and base ten blocks. Spin and multiply bump fall edition includes ten games (numbers 1-10) and students use a spinner (pencil and paper clip) to practice multiplying up to 10x10. 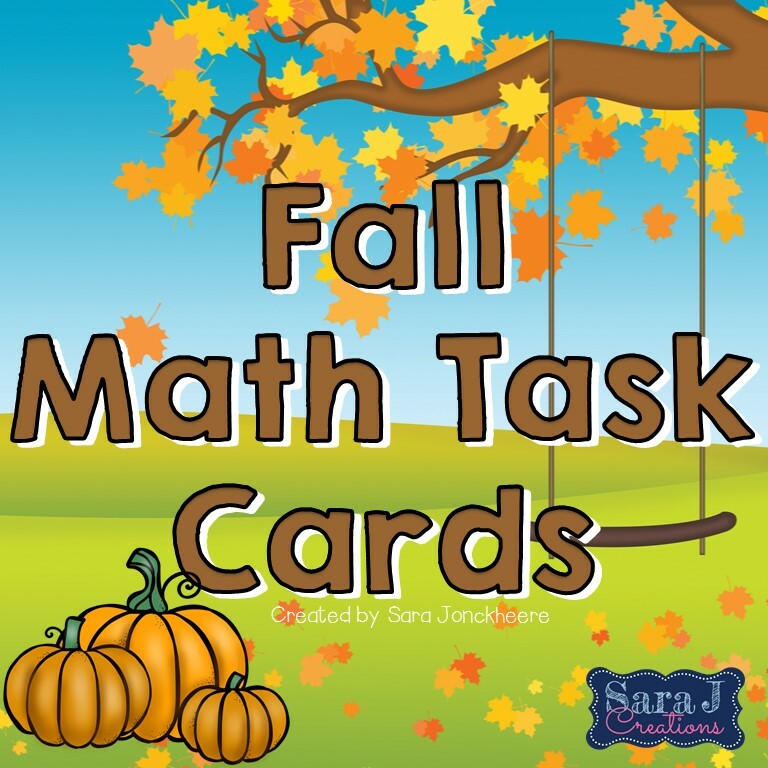 It includes color and black and white boards all with cute fall clip art. Who doesn't love a giveaway? Want $25 to spend at Teachers Pay Teachers? 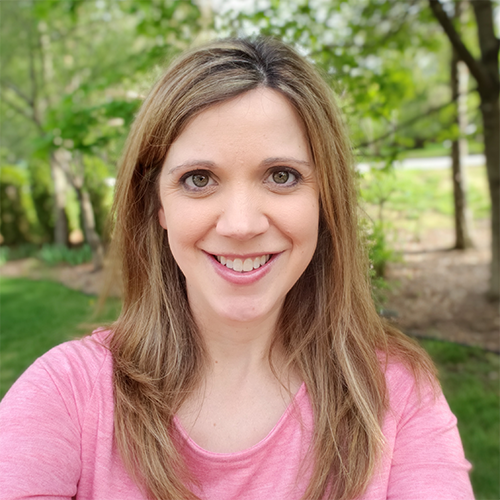 Just enter the rafflecopter below for your chance to win and don't forget that my blogging buddies are giving away a TpT gift certificate at each of their blogs so enter all of them for lots of chances to win!! Thanks for stopping by! Click on the pictures below to continue on in the blog hop and gather more ideas, freebies, sales and don't forget to enter the giveaways! Lots of chances to win. Every blogger will pick a winner plus there will be a winner over at The Primary Punchbowl. You have one week to enter. Good luck and happy fall!! Your craftivity is so FUN! I also LOVE your task cards idea! I am sure your kiddos LOVE completing them!! I LOVE it! I really like your game, super creative and engaging! Super cute! Thank you for sharing! What a great writing activity! And so engaging for students! Thanks for the fun freebie, too! Love the craft with a direction writing activity! Great ideas! Thanks for the freebie. My kiddos love anything with a spinner! YAY! Love that creativity, TPT here I come :) All of your products look great, Sara! Hope you are having a wonderful fall with your two girlies! Make My Pumpkin looks like so much fun! We can't wait to try it! Our kiddos love any kind of craftivitiy! Thank you so much for sharing!!!! I absolutely LOVE bump and add. I can't wait to use this with my kiddos. That bump activity will be so fun! Thanks! Hi Sara! Great post! Your craftivity is ADORABLE and I can't wait to try out the game with my kiddos. Thanks for sharing!